Chosen by Jp, floor staff. 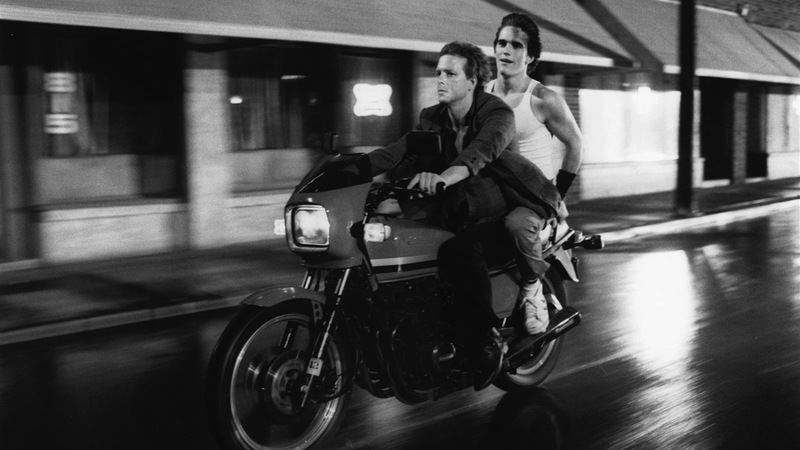 “On Sundays during the Outsiders shoot, Coppola and Hinton worked on the script for RUMBLE FISH, a more intimate but also more strangely mythic narrative than that of The Outsiders. He then enlisted a couple of actors from the other film, Matt Dillon, then eighteen, and Diane Lane, then seventeen, to play its leads. Where for The Outsiders Coppola took a lush, emotive, romantic approach replete with allusions to Gone with the Wind (a favorite movie of one of its characters), with RUMBLE FISH he went about finding himself in a different way. The story here is very simple: Rusty-James (Dillon), a charming, aimless gang leader, searches for meaning in the absence of his legendary older brother, the Motorcycle Boy. The Motorcycle Boy cruises back into town at a crucial juncture for Rusty-James, and the older brother has a message for the younger: he’s not going to find what he’s looking for. The brothers wrestle with their drunkard father, Rusty-James wrestles with his feelings for his sometimes girlfriend, Patty (Lane), a local cop sets his gun sight on the Motorcycle Boy, and all the characters enact gestures and provocations both intimate and archetypal. "Offbeat, daring, and utterly original."